Today, you are a member of... The Ring Cycle - You Are A Member! That’s right members, 25 years ago this week, on March 31st, 1985 the world was introduced a new and monsterous entertainment black hole – the farcical realism of WRESTLEMANIA. 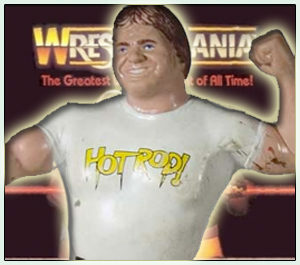 With faces Hulk Hogan and Mr. T pitted against heels “Rowdy” Roddy Piper and Paul Orndorff in the tag team main event, a $15,000 Body Slam Challenge between Andre the Giant and Big John Studd, and an undercard bill that featured King Kong Bundy and The Executioner, the theater of the absurd got way wackier, richer, and acquired a fake tan. This week, there will be no shortage of aerial crossbody maneauvers, head butts, and theater way, way beyond the stoic models of reality. So don’t cling to reason: whether you are a face or a heel, you got a lot of three ringing to do.